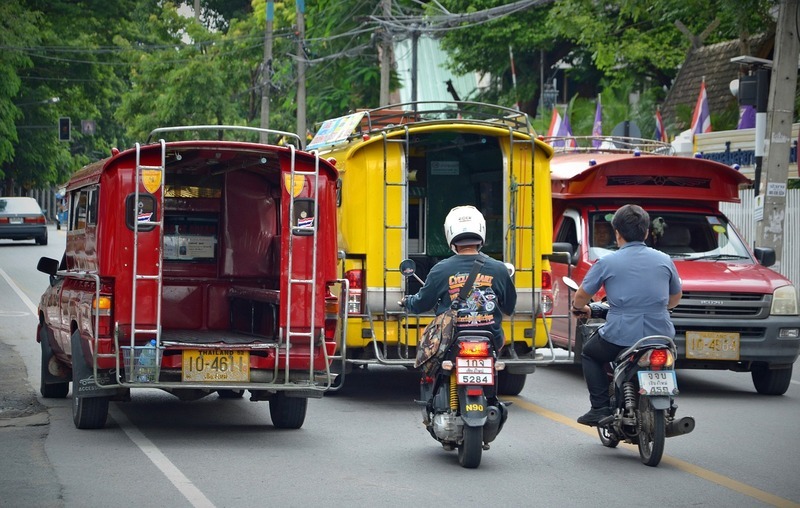 What Is The Best Area To Stay In Chiang Mai ? resorts, and boutique options. The trouble is, there are plenty of bad options as well. This post is going to focus on where to stay in Chiang Mai, but make sure once you’ve chosen your area of choice do yourself a favour and read the reviews of each place carefully. 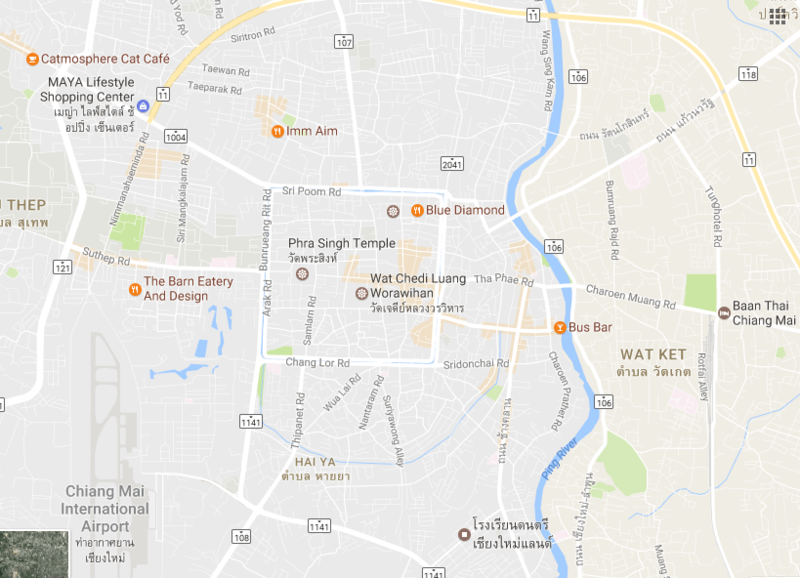 Explaining the best area in Chiang Mai to stay is simple given the cities layout. Everone will have different preferences influencing the best place to stay but we can break it down into two sections. Looking at the map below, the moat is the square in the center and inside the moat is the most touristy area of Chiang Mai! 98% of people will stay somewhere in Chiang Mai that can be seen on this screenshot. Why? Because it’s the best place to stay in Chiang Mai for short visits. The longer you stay the more you’ll want to be outside the moat. Time to break the city into specific Chiang Mai areas. Each edge of Chiang Mai’s square moat just under 2 km long but it can still be broken down into various sections as there are lively spots and the quiet areas. Thaepae (east) Gate is the most popular place inside the moat. It’s also home to the start of Sunday walking street. In this area, there are lots of accommodation options to suit every budget. If you want to be around a happening area, Thaepae Gate is the best area in Chiang Mai to stay for you. You can book all your tours, eat food, drink a beer and visit a market all within a short distance. The rest of the moat interior is similar. The only thing of note is as you get further from Thaepae gate the fewer accommodation options you’ll find (there are still some on every lane). The Southwest corner of the moat has a park, which can be utilized, as a fitness area. A draw card for some, especially for those who like slacklining, sunbathing and acro yoga. The North Gate is most well known for the Northgate Jazz Club which features open mic nights a couple times a week. They’re pretty good too! Monday night is the biggest night, starting at 9pm. Southgate has a nightly food market where you could go every night for a month and still be trying new dishes for just a couple dollars and draws locals, expats and tourists on a consistent basis. http://www.booking.com/hotel/th/jay-guesthoues-and-restaurant.html?aid=1193639″ target=”_blank” rel=”nofollow”>Jay’s Guesthouse is cheap and dirty. Both Jay and ‘Mumma’ are really nice though and will make sure you’re comfortable. The location is epic, they have a restaurant downstairs with decent food at good prices. There’s a few temples nearby, a 7/11 next door and of course, Zoe’s to party at 300 metres away. Puily’s is in a quieter area further away from Thaepae unlike Jay’s but still has plenty of stuff around with the Nong Buak Park ready for your slacklining and acro yoga skills and Wat Pra Singh is an awesome temple 400m up the road (and to one end of Sunday walking street). Located in the NE corner of the moat, there are some epic breakfast cafes around here with Blue Diamond leading the way, though I could happily eat the green curry at Mild all day every day. You’ve got the North Gate Jazz club and night market nearby and Thaepae gate close enough too. Located near the Three Kings Monument in the city center, this place is in a are as good as any in the old city. The rooms are really good value here and with tours able to be booked downstairs, you’re in for a pleasant stay here and an easy escape from the Sunday market. Located right by Thaepae Gate everything is on your door step. You’ve got the Sunday walking street, Muay Thai stadium, restaurants galore, bars, cool cafes and lots of tour agencies. The area can be a bit hectic, but that’s alright as you’ve got a pool to come back too! One of my favourite areas just inside the South Gate this spot. Because of the South Gate market, but also it’s a little bit quieter with no major sites nearby other than Wat Chedi Luang. It’s only a few minutes however to find the action as with anywhere inside the old city. Nimman (Nimmanhaemin Road and the soi’s) is Chiang Mai’s answer to the Melbourne’s Fitzroy, Wellington, America’s Portland & Austin (hipster vibes). Nimman is within walking distance of Chiang Mai University and is the hub for digital nomads. There’s a thriving café scene, high-end retailers and a diverse selection of restaurants, bars and clubs. There’s not much in the way of tourist activities but the atmosphere is addictive and more hostels are popping up in addition to the current hotel and apartment selection. There is a bit of negative attention around Nimman however as you’ll see in this video. Loi Kroh Road is probably the street closest to Khao San Road in Chiang Mai. It’s full of hostels, pubs, restaurants and massage shops where you can get a happy selection if you really want. It isn’t a dirty street and has a variety of accommodation options. Loi Kroh Road just has that tacky vibe about it when the sun goes down. Located between the moat and the Ping River you get easy access to the night bizarre and cabaret and the Bus Bar drinks are here each week (an awesome Couchsurfing event). Santitham is starting to develop with its own personality. This area is a great place to stay if you want to be outside the city in a quieter area, yet close enough to walk to everything. There are plenty of restaurants popping up in Santitham lately and the bars are starting to draw people in from other areas of town. This is my new favourite area to stay I think in 2017, there are lots of positives with little downsides. South of the Moat is the most ‘local’ section of the city and unless you have an accommodation choice you really want to stay in you can leave out this section of the city for short-term stays. If you are staying here long term, you should consider the neighbourhood Chiang Mai Land (yes that really is the name). Chiang Mai Land is a small suburb about a 6-minute drive from southgate. It’s definitely very quiet yet has easy access to one of the larger roads that allows you to get to Nimman without too many issues. I loved living in this spot. Hostel Sticky Rice is located right on the Saturday Walking Street so if you stay there then, be prepared for crowds. Otherwise, this is located minutes from the moat but best of all, you get to go and visit Ms. Pa and drink the best smoothies in town at the South Gate night market(she now makes banana oreo smoothies)! Mapping Hostel is along the Ping River, so you probably would want a bicycle at least, if not a scooter. The best reasons to stay here are Bus Bar just on the other side of the Bridge and further up the road at Kinta Cafe you essentially have a riverside cat cafe! Located just below South Gate, Noble House has been a constant in Chiang Mai with a massive motorbike rental place attached. The owner, while sometimes sneaky with getting you to pay too much for a bike, will give you plenty of tips for places to check out. Get the Pa smoothie while here, obviously. Other than the brilliant name, this place a few hundred metres north of the moat is in a quiet area which is best if you’re planning to stay for a few days. This area is getting some cool restaurants and cafes popping up, as well as being not far from the running track for those who keep fit travelling. Located in Nimman, this is the most expensive area in Chiang Mai but there are some great deals you can find. Salad Concept is popular with everyone and for cafes, you’ve got Rustic & Blue leading the way. Just walk and see what takes your fancy, you can’t go far wrong. Again in Nimman (notice how these two are the only places in Nimman in the article), you’ll find higher prices in general here. If you like movies, there’s Maya Mall a few minutes walk away and there are a few more night markets popping up on that intersection too (with a variety of goods for sale). So where is the best area to stay in Chiang Mai? If you’re just staying for a few days and want to get lots of stuff done, your best bet is to stick to the areas inside the moat. For those who stay for a week or more, think about what you want to do in terms of activities and your mode of transport. If you have a scooter and plan to take it easy day by day west of the moat (Santitham/Nimman) is considered the best neighborhood to stay in Chiang Mai. 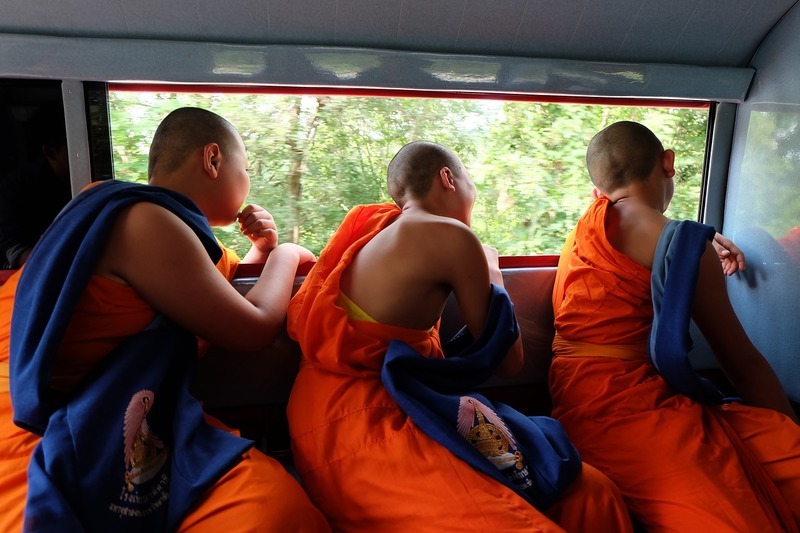 RELATED POST: SHOULD YOU VISIT CHIANG MAI DURING BURNING SEASON? 0.02USD? REALLY…that’s amazing. Where do you find the promo days, Cat? B2 hotel chain sometime do promotion price. On 2d November any people can booking in B2 Santhitam room with twin bed only 6 THB. We follow some hotel news and promo feed and if have really good promo – we post it on our FB page. 6 THB for twin bed room this is really crazy price. How do they do it so cheap??!! Thanks for the heads up, Cat!